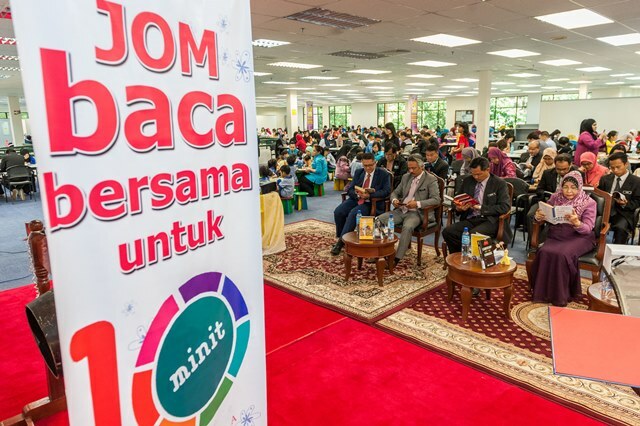 MONDAY, 25 APRIL – Universiti Malaysia Sabah (UMS) campus community today joined in the ‘Let’s Read Together for 10 Minutes’ simultaneously at UMS Library and mini libraries of faculties including at the Sustainable Minds Centre (PML) UMS and UMS Labuan International Campus. The programme which began at 11.00 this morning was participated by senior staff of UMS and its students, including 26 children from PML. Earlier, the Chief Librarian of UMS, Dg Rukiah Ag Amit in her speech at the launching of the event said, the programme aimed at encouraging the campus community to practice the habit of reading, beginning with the first step of reading for 10 minutes as a commitment by all parties on the importance of reading. “Besides that, this 10 minutes of reading is to instill in us the need to take some time to gain knowledge through reading as a daily practice. “There is no short cut to success in any field, but by inculcating the reading habit and courage to explore various challenges in the world full of ups and downs before we could taste the fruit of our labour,” she said.